Face of metal wax seal engraved with the name “Frances.” The short ornate handle is decorated with a thin layer of gold, or “gilt”, and a blue ribbon. The seal may have been made from sard, a brownish-red variety of chalcedony or quartz mineral used as a gemstone (carnelian). 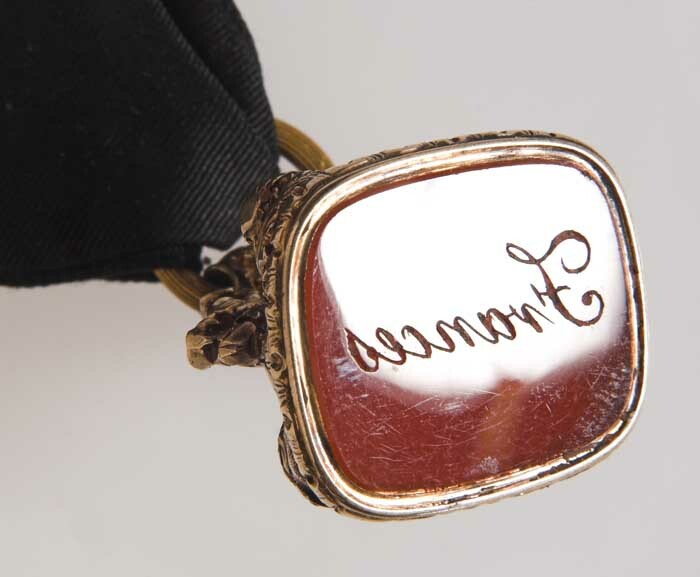 This seal once belonged to Frances Simpson, the wife of Sir George Simpson. What is different between Image 1 and Image 2 of the seal? Which image is the accurate one and how do you know? In the early 19th century, letters were hand-folded and sealed with wax rather than glue. The purpose of the wax seal was to secure the contents of the letter and to identify the sender. In order to seal a letter, a lit candle was tipped over the area to be closed. A sealing wax was held to the candle flame, allowing the droplets of wax to pool at the open edge of a fold. The wax was then stamped with an engraved instrument called a seal. The sealing wax contained a resin and other materials that made it hard and glossy. This enabled the user to make an impression into the soft wax without its losing its shape.